Whether it's one of our great vacation packages or easy access to Monterey Bay attractions like Fisherman's Wharf and Pebble Beach, travelers have fallen for Best Western Carmel's Town House Lodge. Warm hospitality, a quaint atmosphere and our focus on customer experience make us a local favorite. Take a few minutes to browse guest reviews of our Carmel, CA hotel. You won't want to settle for anywhere else for your next ocean-side getaway. Front staff woman was very nice. Accommodated me staying an extra night. Look forward to coming back! 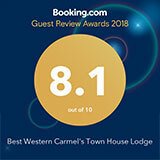 I enjoyed staying at the Carmel Best Western. Room was clean and fresh smelling. The room was well lit by light from the window. The room was easy to access as it was on the first floor. The staff at the front desk were helpful and friendly. I will stay here again. The location of the Best Western is convenient to walk to shops and restaurants.